So to give you guys an update on what is going on thus far Friday night, not only is the new nightlife and event company Overtime having a happy hour at the Hill from 7-8, there's also a secret Chinese New Year celebration (if you wanted to attend this RSVP is closed, sorry!) AND a Fashion Industry Cocktail Party! 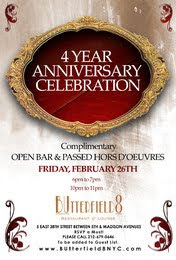 NOW Butterfield 8, a venue that has been home to many shenanigans, is having their Four Year Anniversary Party, offering an open bar from 6-7 and 10-11 and then also offering passed hors d'oeuvres. If you want to attend you must RSVP here. Not sure if you like to party hop like I do, but it looks like it'll be a good time. There's usually a line so arrive early! Heads up on the 4 Year Anniversary Celebration courtesy of 89th and Broke. GIrl I have been waiting for you to start one of these! You always have the best ideas!